(CNN) -- An alien with a lemon-shaped head and a jazz-themed encounter with a UFO at the Glastonbury Festival are among hundreds of UFO sightings detailed in the latest batch of documents released Monday by the UK's Ministry of Defence. 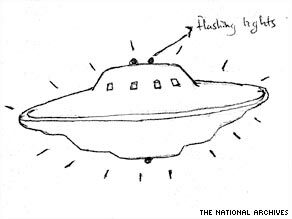 A sketch of a UFO made by a witness following a sighting in 1993. Fourteen files, containing over 4,000 pages of UFO sightings from 1981 to 1996, have now been placed on Britain's National Archives database and are publicly available online. The sightings range from lights in the sky to close contact with aliens, and the files contain detailed analysis on some of the UK's most popular cases -- a number of which remain officially unexplained. In one incident in 1995, two men in their 20s from Staffordshire, central England, told police they saw an alien with a lemon-shaped head descend from a hovering UFO and tell them "We want you; come with us." However, 90 percent of cases have been accounted for. Multiple sightings of a brightly illuminated oval object in London during 1993 and 1994 were later explained as an airship advertising the launch of the Ford Mondeo car. Blog: Do you believe in UFOs? The documents reveal that in 1996 there were 608 sightings, a dramatic surge from the previous year's 117. However, this may have less to do with exceptional levels of extra-terrestrial activity, than with the release of blockbuster film "Independence Day" and the popularity that year of sci-fi TV series "The X-Files." David Clarke, a UFO expert and journalism lecturer at Sheffield Hallam University who has studied the files, said: "Obviously, films and TV programs raise awareness of UFOs and it's fascinating to see how that appears to lead more people to report what they see." Clarke's comments certainly correspond with the other periods of high-frequency sightings in Britain -- one of the other busiest years was in 1978, the same year in which Steven Spielberg's alien-themed "Close Encounters of the Third Kind" was released. The files also shed new light on Britain's own 'Roswell', the Rendlesham Forest sightings of December 1980 in which American air force men saw a series of mysterious lights in the trees at the perimeter of an air base used by the U.S. Air Force. The then government of Margaret Thatcher was quick to dismiss the incident, but a letter from a former chief of defense staff in 1985 warned that the affair could prove a 'banana skin' for the Ministry of Defence. "The case has puzzling and disquieting features which have never been satisfactorily explained ... which continue to preoccupy informed sections of the public," said the letter. Other documents reveal a UFO incident in Belgium between 1989 and 1990 when Belgian Air Force F-16 fighters were scrambled to intercept abnormal, brightly-lit, triangular flying objects reported by police and others. In November 1993 General Wilfried de Brouwer, chief of operations in the Belgian Air Staff, confirmed that the fighters had locked-on to something with their radar but were unable to explain what it was. The MoD affirmed that there had been no threat to the UK and that it has never detected a "structured craft flying in UK airspace that has remained unidentified." This latest release of documents represents the fourth set of UFO files released since 2008 as part of a three-year project in conjunction with the National Archives.